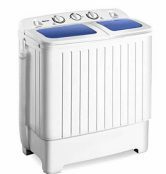 Having waterproof shower speaker in your bathroom can be a fun and entertaining experience. As you shower, you can listen to your favorite songs thanks to these water-resistant speakers. You can also control the volume and the songs or even take phone calls. Here are top waterproof shower speakers that are water-resistant, lightweight and produce clear audio which is loud enough for better shower experience. Here are some of the best rated portable waterproof speakers which can be used anywhere near water. 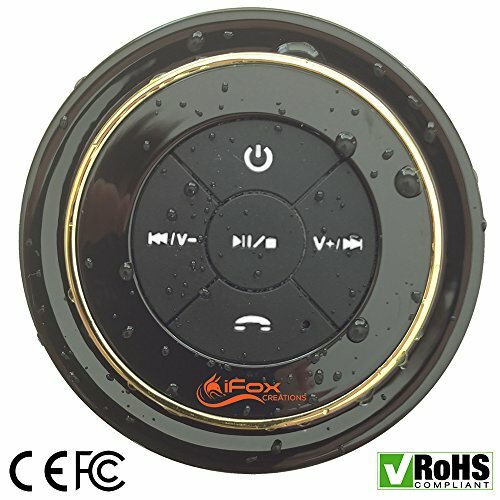 The iFOX iF012 is one of the best speakers to use in the shower. It is fully waterproof and even fully submersible up to 3 feet in depth. It runs on just 3 watts of power but delivers the amazing sound you would expect from a boombox. The new 2016 model has a white filled button enhancement making it easier to use the buttons in the shower. Controls are intuitive and easy to use. 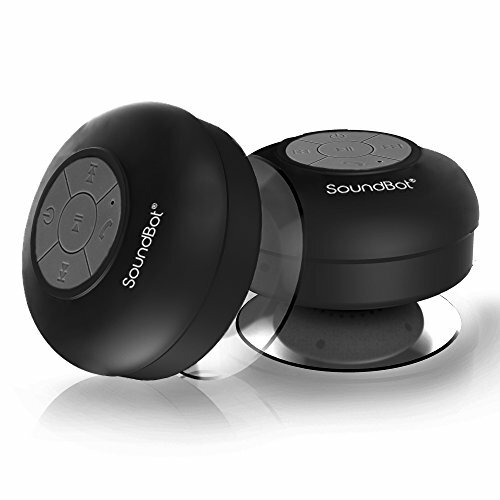 The speaker is easy to charge and pair with your phone or other Bluetooth device. Works just like any other hands-free device. The suction cap attaches strongly to glass, ceramic, or any other smooth surface in the shower. It fixes easily and securely to any bathroom surface. Because it is waterproof, you don’t have to get worried about it being sprayed or falling into the bath. Bluetooth has good range. 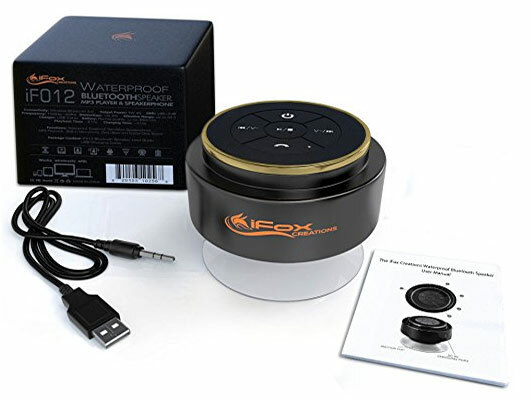 The microphone function in this waterproof shower speaker means that the iFox can double as a phone receiver (this speaker is also Siri compatible). Its use is not limited to the bathroom. You can use it in the garden, at the beach, in the park, at a picnic, or anywhere that you want to listen to music without access to a full sound system. Battery lasts for up to 10 hours. You can plug it into the adaptor, and it will be fully charged within 3 hours. 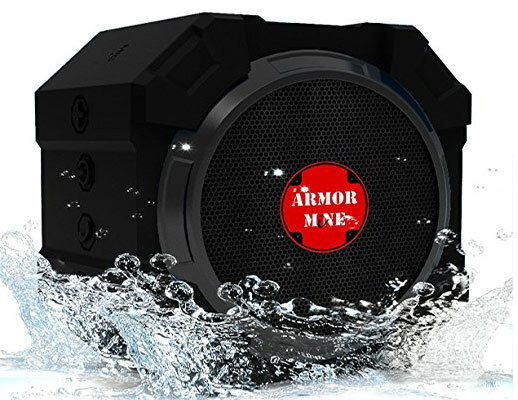 It’s a very well designed waterproof Bluetooth shower speaker that features a beautiful sealed silicone case which makes it waterproof, shockproof, dustproof and can be used in environments other than the shower. The has a nice rubbery exterior that lowers the chance of a slip drop and can be cleaned without worrying about scratches. 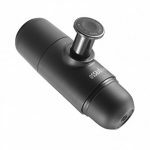 It has a nice sturdy suction cup on the back which attaches securely to glass and is perfect for bathrooms or glass windows. The speaker has a built-in MIC Bluetooth speaker and hands-free function. 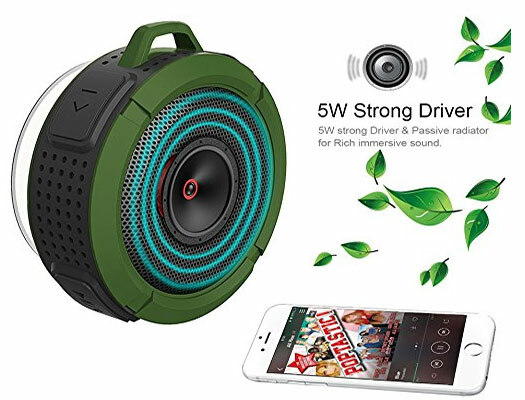 You can pick up a call using this mini speaker in the car, bathroom, at home or office, or anywhere when it is connected to your Smartphone without problems. The sound is amazing for such a small device. The maximum volume on this speaker can go loud. It comes with built-in rechargeable battery supports up to 6 hours of play time. The rigid and lightweight construction means that, should this speaker slide or fall off the wall and hit the floor, you can be assured that your speaker and music will remain intact. 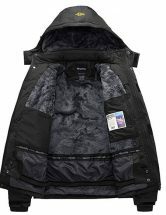 This particular model also comes with a camping hook which makes it ideal for bringing it outdoors. The Photive Waterproof Shower Speaker is a notch above other water-resistant speakers. The first thing you will surely notice is that it is thunderous. Sound quality is excellent for a speaker of this size. 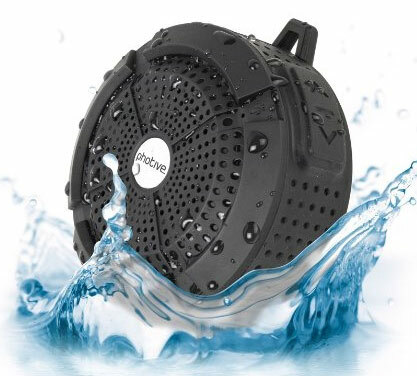 The Photive speaker is waterproof, shockproof, dustproof and rated IP65 for 100% protection against water and dust. The rubberized rugged exterior provides splendid impact resistance. 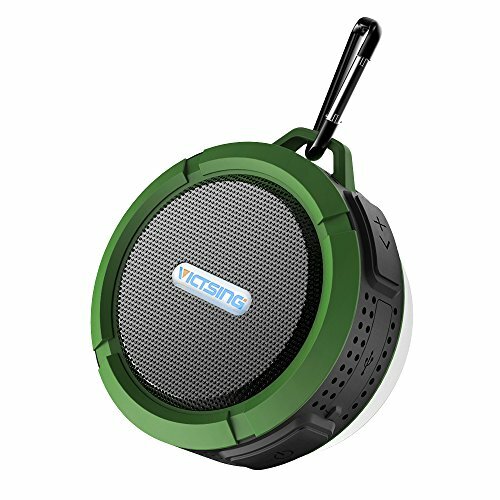 As such, this speaker is perfect for the shower, but it’s also ideal for hiking, camping, cycling, or any other outdoor activity. The speaker is designed with a suction cap so you can attach the speaker to the shower wall. As the alternative, you could also use the carabiner clip on the top to clip it to any small surface. The speaker comes with features like a power button, answer call button, volume up and down, and skip forward and previous controls. The speaker’s lithium-ion rechargeable battery charges quickly and lasts for quite a while. The Photive waterproof Bluetooth shower speaker is a reliable, durable and versatile speaker that has multiple functionalities and awesome audio performance. The fact that the sound on these speakers can go really loud is an added plus, which means that you can shower in the bathroom without your music being muffled by the shower. 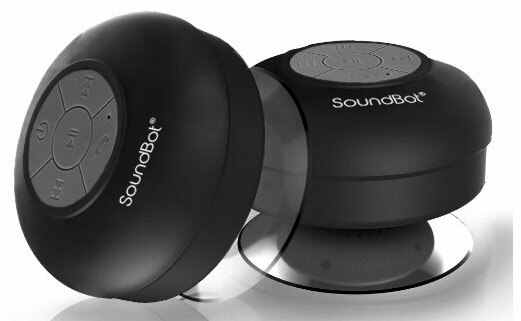 If you are looking for a cheap waterproof speaker, SoundBot is a great option if budget is your primary concern. It’s available in various colors making it easy to find something that meshes with your decor and your personality. SB510 HD Shower Speaker has a water-resistant capability, built-in microphone that can last up to six hours of playtime, user-friendly multi-function buttons, wireless connection, and efficient suction cups perfect for both indoor and outdoor usage. Since the device supports an HD wireless connectivity, you can remotely play your music and use your online music tracks throughout your home, or wherever you are using Bluetooth-enabled gadgets that are supported by Android and iOs. This waterproof shower speaker has an attached suction cup that lets users stick it to any desired surface. It sticks well to a shower wall, on a kitchen counter or almost anywhere and doesn’t fall off easily. There are round holes at the back of the speaker body where sounds go out, and these holes are also water-resistant. In the case water gets inside them, the sound will be a bit muffled until the water drains out. It also comes with a USB cable for charging that can be plugged into any USB adapters or computer USB slots for faster and more convenient charging time. The Photive HYDRA is a larger speaker. It is ideal for being placed poolside on along the edge of a tub. Wireless and portable are perhaps the most important features for the Photive HYDRA wireless Bluetooth waterproof speaker. Photive HYDRA speaker is small but compact and gives out a great quality sound. This speaker comes with a lithium-ion battery that can last up to eight hours of non-stop music once it is fully charged. Photive is dustproof, shockproof and waterproof. 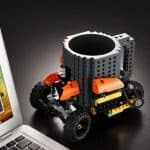 You can control the volume, and the quality of the speaker from the paired Bluetooth devices like computers, smartphones, and laptops or you can control it using buttons on the speaker. The controls for volume are at the top of the speaker. The sound controls are on the right-hand side of the Bluetooth button, and the volume controls are on the left side. Next to the USB port, there is an auxiliary in port that allows the user to connect the speaker with devices that are not Bluetooth enabled. At one end of this speaker, there is a cover that keeps water out. When you open the cover, you will see the aux in-port, the USB port and the on and off button. There are a built-in microphone and speakerphone, which you can use to receive calls coming in through your smartphone. 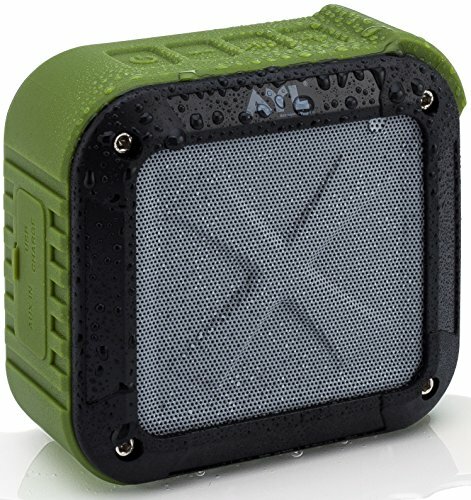 This is a top quality and great waterproof wireless speaker. It is little and portable but big on sound. The sound is crisp. Volume goes up easily, and the bass is very strong and super nice. The speaker itself controls the smartphones very well, which is a must for a shower speaker. You can keep your phone on the bathroom sink and control it with ease (Skip, volume, go back, answer or decline calls, etc.). In addition the Bluetooth, pairing is very simple. It detects your device right away, and the sound transitions from the device to the speaker is without delay. The M4 is IP54-rated splash-proof, shock-proof, and dust-proof. 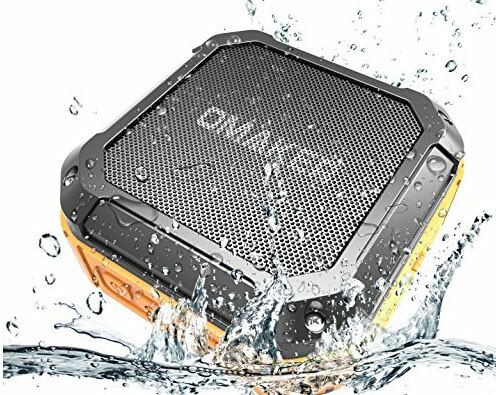 While Omaker doesn’t recommend actually submerging the speaker, the occasional splash shouldn’t pose a problem, nor should using the speaker in the shower. Despite the low price, the Omaker M4 doesn’t lack when it comes to its wireless connectivity. It features Bluetooth version 4.0 and even NFC pairing for compatible devices. Omaker claims 12 hours of playback for the M4. While that isn’t a staggering number, the strange part is that this is stated as at 80 percent volume, while many companies use 50 percent volume for their playback estimations. The actual capacity is 1500 mAh, and the speaker charges in 2 to 3 hours using the USB port hidden under the waterproof flap. The audio quality certainly isn’t going to blow you away, but if you want a daily shower speaker, or even just something you won’t feel bad about leaving in the rain, the M4 will handle that and more. If you can’t live without music, then you should definitely consider getting a Bluetooth waterproof shower speaker. Since the early Bluetooth speakers, their technologies have come a long way. Now, you can enjoy your shower while also listening to your favorite tunes that the Bluetooth speaker can stream from your phone, tablet or computer, as well as your favorite radio apps. 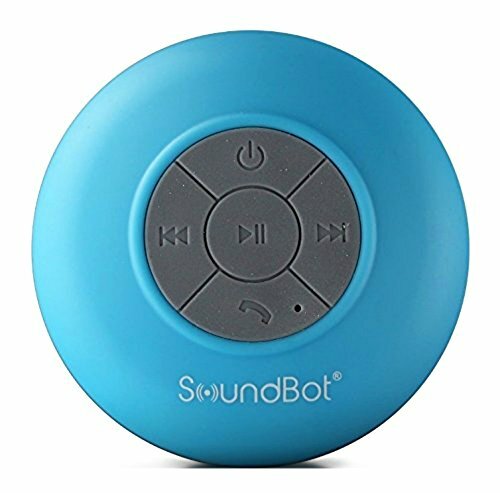 Waterproof Bluetooth speakers are useful not only in showers, but also in a variety of other situations, such as for listening to music by the pool, while camping, or working out. 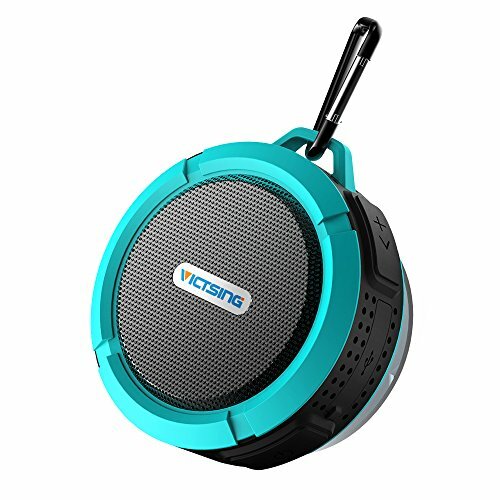 If you can’t live without music, then you should definitely consider getting a bluetooth waterproof shower speaker.They are not only useful in shower, but also in a variety of other situations, such as for listening to music by the pool, while camping, or working out.